The European Parliament has approved a draft version of new EU internet censorship law targeting terrorist content.In particular the MEPs approved the imposition of a one-hour deadline to remove content marked for censorship by various national organisations. However the MEPs did not approve a key section of the law requiring internet companies to pre-process and censor terrorsit content prior to upload. A European Commission official told the BBC changes made to the text by parliament made the law ineffective. The Commission will now try to restore the pre-censorship requirement with the new parliament when it is elected. The law would affect social media platforms including Facebook, Twitter and YouTube, which could face fines of up to 4% of their annual global turnover. What does the law say? In amendments, the European Parliament said websites would not be forced to monitor the information they transmit or store, nor have to actively seek facts indicating illegal activity. It said the competent authority should give the website information on the procedures and deadlines 12 hours before the agreed one-hour deadline the first time an order is issued. In February, German MEP Julia Reda of the European Pirate Party said the legislation risked the surrender of our fundamental freedoms [and] undermines our liberal democracy. Ms Reda welcomed the changes brought by the European Parliament but said the one-hour deadline was unworkable for platforms run by individual or small providers. The EU Council of Ministers has approved the Copyright Directive, which includes the link tax and censorship machines. The legislation was voted through by a majority of EU ministers despite noble opposition from Italy, Luxembourg, Netherlands, Poland, Finland, and Sweden.As explained by Julia Reda MEP, a majority of 55% of Member States, representing 65% of the population, was required to adopt the legislation. That was easily achieved with 71.26% in favor, so the Copyright Directive will now pass into law. As the image above shows, several countries voted against adoption, including Italy, Luxembourg, Netherlands, Poland, Finland, and Sweden. Belgium, Estonia, and Slovenia absta ined. It will be more important than ever for civil society to keep up the pressure in the Member States! Tackling terrorism and the criminal actors who perpetrate it is a necessary public policy objective, and the internet plays an important role in achieving this end. The tragic and harrowing incident in Christchurch, New Zealand earlier this month has underscored the continued threat terrorism poses to our fundamental freedoms, and the need to confront it in all its forms. However, the fight against terrorism does not preclude lawmakers from their responsibility to implement evidence-based law that is proportionate, justified, and supportive of its stated aim. ÂUnclear definition of terrorist content: The definition of ‘terrorist content’ is extremely broad, and includes no clear exemption for educational, journalistic, or research purposes. This creates the risk of over-removal of lawful and important public interest speech. Lack of proportionality: The regulation applies equally to all internet hosting services, bringing thousands of services into scope that have no relevance to terrorist content. By not taking any account of the different types and sizes of online services, nor their exposure to such illegal content, the new rules would be far out of proportion with the stated aim of the proposal. We fully support efforts to combat dangerous and illegal information on the internet, including through new legislation where appropriate. Yet as currently drafted, this Regulation risks inflicting harm on free expression and due process, competition and the possibility to innovate online5. Given these likely ramifications we urge you to undertake a proper assessment of the proposal and make the necessary changes to ensure that the perverse outcomes described above are not realised. At the very least, any legislation of this nature must include far greater rights protection and be built around a proportionality criterion that ensures companies of all sizes and types can comply and compete in Europe. The European Parliament has backed disgraceful copyright laws which will change the nature of the net.The new rules include holding technology companies responsible for material posted without proper copyright permission. This will destroy the livelihoods of European people making their living from generating content. Article 11 states that websites will either have to pay to use links from news websites or else be banned from linking to or quoting news services. It means they would need to pre-censor content before it is uploaded. Only the biggest US internet companies will have the technology to achieve this automatically, even then technical difficulties in recognising content will results in inevitable over censorship from having to err on the side f caution. The campaign group Open Knowledge International described it as a massive blow for the internet. Dark day for internet freedom: The @Europarl_EN has rubber-stamped copyright reform including #Article13 and #Article11. MEPs refused to even consider amendments. 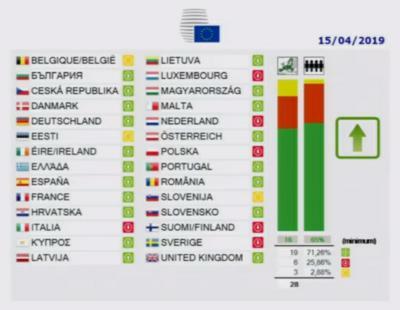 The results of the final vote: 348 in favor, 274 against #SaveYourInternet pic.twitter.com/8bHaPEEUk3 204 Julia Reda (@Senficon) March 26, 2019. Websites and businesses across Europe went dark yesterday in protest of disgraceful changes to copyright law being introduced by the European Union.Ahead of a final vote on the legislation next Tuesday, March 26th, a number of European Wikipedia sites are going dark for the day, blocking all access and directing users to contact their local EU representative to protest the laws. Other major sites, such as Twitch and PornHub, are showing protest banners on their homepages and social media. 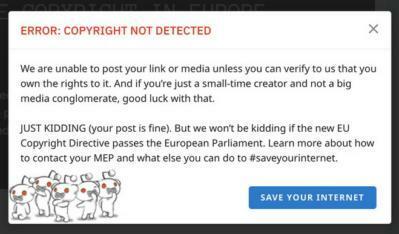 Meanwhile, any users uploading content to Reddit will be shown this notice: Critics of the Copyright Directive say it could lead to messages like this. The law in question is the EU Copyright Directive, a long-awaited update to copyright law. Two provisions have been singled out by critics as dangerous to European people’s freedom and livehoods. These are Article 11, which lets publishers charge platforms if they link to their stories (the link tax’), and Article 13, which makes platforms legally responsible for users uploading copyrighted material (the so-called ‘upload filter’). Article 13 is particularly dangerous, say critics. It will make all platforms hosting user-generated content legally responsible for users uploading copyrighted content. The only way to stop these uploads, say critics, will be to scan content before its uploaded, leading to the creation of filters that will err on the side of censorship and will be abused by copyright trolls. Wikipedia said the rules would be a “net loss for free knowledge.” Volunteer editors for the German, Czech, Danish, and Slovak Wikipedias have all blacked out their sites for the day. As well as the website blackouts , more than five million internet users have signed a petition protesting Article 13 . Marches and demonstrations are also planned in European cities across the weekend and on Monday and Tuesday before the final vote. Members of the European Parliament are considering a proposition for the censorship of terrorist internet content issued by the European Commission last September.The IMCO Committee (“Internal Market and Consumers protection”) has just published its initial opinions on the proposition. The idea is that the government of any European Member State will be able to order any website to remove content considered “terrorist”. No independent judicial authorisation will be needed to do so, letting governments abuse the wide definition of “terrorism”. The only thing IMCO accepted to add is for government’s orders to be subject to “judicial review”, which can mean anything. In France, the government’s orders to remove “terrorist content” are already subject to “judicial review”, where an independent body is notified of all removal orders and may ask judges to asses them. This has not been of much help: only once has this censorship been submitted to a judge’s review. It was found to be unlawful, but more than one year and half after it was ordered. During this time, the French government was able to abusively censor content, in this case, far-left publications by two French Indymedia outlets. Far from simplifying, this Regulation will add confusion as authorities from one member state will be able to order removal in other one, without necessarily understanding context. Regarding the one hour delay within which the police can order a hosting service provider to block any content reported as “terrorist”, there was no real progress either. It has been replaced by a deadline of at least eight hours, with a small exception for “microentreprises” that have not been previously subject to a removal order (in this case, the “deadline shall be no sooner than the end of the next working day”). This narrow exception will not allow the vast majority of Internet actors to comply with such a strict deadline. Even if the IMCO Committee has removed any mention of proactive measures that can be imposed on Internet actors, and has stated that “automated content filters” shall not be used by hosting service providers, this very tight deadline, and the threat of heavy fines will only incite them to adopt the moderation tools developed by the Web’s juggernauts (Facebook and Google) and use the broadest possible definition of terrorism to avoid the risk of penalties. The impossible obligation to provide a point of contact reachable 24/7 has not been modified either. The IMCO opinion has even worsened the financial penalties that can be imposed: it is now “at least” 1% and up to 4% of the hosting service provider’s turnover. The next step will be on 11 March, when the CULT Committee (Culture and Education) will adopt its opinion. The last real opportunity to obtain the rejection of this dangerous text will be on 21 March 2019, in the LIBE Committee (Civil Liberties, Justice and Home Affairs). European citizens must contact their MEPs to demand this rejection. We have provided a dedicated page on our website with an analysis of this Regulation and a tool to directly contact the MEPs in charge. Starting today, and for the weeks to come, call your MEPS and demand they reject this text. Last week’s publication of the final draft of the new EU Copyright Directive baffled and infuriated almost everyone, including the massive entertainment companies that lobbied for it in the first place; the artists’ groups who endorsed it only to have their interests stripped out of the final document; and the millions and millions of Europeans who had publicly called on lawmakers to fix grave deficiencies in the earlier drafts, only to find these deficiencies made even worse . Thankfully, Europeans aren’t taking this lying down. With the final vote expected to come during the March 25-28 session, mere weeks before European elections, European activists are pouring the pressure onto their Members of the European Parliament (MEPs), letting them know that their vote on this dreadful mess will be on everyone’s mind during the election campaigns. The epicenter of the uprising is Germany, which is only fitting, given that German MEP Axel Voss is almost singlehandedly responsible for poisoning the Directive with rules that will lead to mass surveillance and mass censorship, not to mention undermining much of Europe’s tech sector. A viral video of Axel Voss being confronted by activists has been picked up by politicians campaigning against Voss’s Christian Democratic Party in the upcoming elections, spreading to Germany’s top TV personalities, like Jan Böhmermann. Things are just getting started. On Saturday, with just two days of organizing, hundreds of Europeans marched on the streets of Cologne against Article 13. A day of action –March 23, just before the first possible voting date for MEPs–is being planned, with EU-wide events. In the meantime, the petition to save Europe from the Directive –already the largest in EU history–keeps racking up more signatures, and is on track to be the largest petition in the history of the world.